Mark Lopez graduated from the University of Pennsylvania in 2003 as a doctor of veterinary medicine. His family had been in Berks County for nine generations. His grandfather started the Oley Valley family dairy farm and inspired Mark’s interest in agriculture. However Mark’s life took a little turn in a different direction after graduating. The experience would later become essential life lessons for doing dairy differently. Mark began his career working as a veterinarian at a large industrial dairy operation in Texas and later in surrounding states. Mark was able to see first hand the inhumane conditions of industrial food production. According to this article he found the system very backwards. He was helping sick and injured cows only to send them back to unhealthy living conditions. He felt that he was being part of the problem and only helping to maintain the status quo. "There were just miles and miles of corn and huge dairies, like 12,000-cow dairies. I missed home." After five years he left Texas to go back to the Douglassville family farm after his uncle invited him to come back and give it a go. Mark opened Wholesome Dairy Farms in April 2008 and holds his animal’s health and welfare as top priority. At the time Pennsylvania allowed some farmers to get permits to sell raw milk, even though in most states selling it was illegal. Around the time there was about 128 who had state licenses (in 2013 there were 163). The agriculture department's regulations were strict requiring milk to be tested twice a month for bacteria and each cow's health needed to be checked annually. Mark says that surprise visits are common to this day. The state is very attentive. In addition to the tests required by the state, Mark does his own testing to monitor the quality of his product. Raw dairy farmers face a higher level of scrutiny at the federal level than other food producers. According to the Raw Milk Nation Map retail sale of raw milk is legal in Pennsylvania along with 10 other American states. At the moment 43 out of 50 states allow distribution of raw milk in some form. It is illegal in only seven states. Mark started with 40 Ayrshire cows. They are generally a smaller breed than the typical black and white Holstein cows usually associated with milk production. They are from Scotland and the milk has a distinct high fat content perfect for making cheese. In 2009 Mark asked his farmhand Rebecca Seidel to help make cheese. Today the farm sells a variety of value-added dairy products like yogurt, cheese and dairy drinks made in the commercial kitchen approved by the Pennsylvania Department of Agriculture. Rebecca makes hard, semi-hard and soft cheeses that is required a 60 day ageing period by the FDA. What sets this dairy apart. Mark has returned the farm to the rotational grazing done in the '30s and '40's. The cows are moved regularly from pasture to pasture, giving the grass time to regrow. The farm wasn't always dedicated to grass-fed sustainable dairying. According to this article Mark says his uncle ran a "heavy metal" dairy operation. There were often sick and dead cows because in a commercial dairy they must be milked as hard as possible because the profit margin is so low. Mark says that his cows produce half as much milk compared to a corn- or soy-fed cow but the milk tastes better. He says there is value in his product because it is a small-scale operation that has traceability and the milk has the unique identity from the farm. When Mark started Wholesome dairy with his new herd of Ayrshire cows he knew that his cows were healthy and going to produce a clean, delicious product. He leads farmer-to-farmer educational events for groups too and loves to be able to inspire others. Mark is dedicated to the local food movement and sustainable dairy farming. 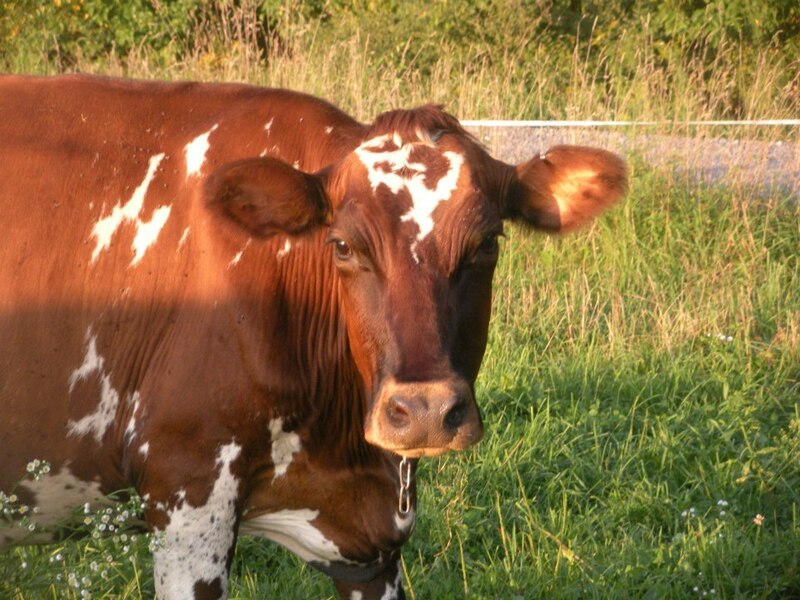 For more information on why a pasture-based diet is best see this article: The Grass-fed Raw Milk Movement. Video: Tracy Toth interviews Mark Lopez. October 2010. "It's not difficult to get a clean raw milk that has a long shelf life of 3 weeks." Posted on September 28, 2017 by ARMM Admin and filed under Raw Milk and tagged raw milk dairy examples animal welfare sustainable dairy farming 100% grass-fed grass-fed raw dairy.